Hurricane Maria lashed the northeast coast of the Dominican Republic on Thursday after leaving a path of destruction in Puerto Rico. Maria left millions of people in Puerto Rico facing the dispiriting prospect of weeks and perhaps months without electricity. The Category 3 storm was blamed for at least 19 deaths. Maria's next potential target was the Turks and Caicos Islands, which are still recovering from Hurricane Irma. On Wednesday, Maria barreled through Puerto Rico from end to end, knocking out all the power. It was the strongest hurricane to hit the U.S. commonwealth in more than 80 years. Officials said recovery will take months. CBS News' David Begnaud reports that in the coastal city of Cantano, residents forged through flooded streets, heading to the only open grocery store. Only five were allowed in at a time to avoid chaos. Begnaud said in the small town of Toa Baja, hundreds of residents were rescued by the National Guard, packed into trucks while scores of others waded through two feet of water, carrying what's left of their possessions. Supreme Court Justice Sonia Sotomayor, whose family is from Puerto Rico, says she hasn't yet heard from half her family after Hurricane Maria walloped the island. Sotomayor, the high court's first Hispanic justice, was speaking Thursday at an event at the Newseum in Washington. She said Puerto Rico "is suffering a great tragedy right now." Sotomayor says that she and her family in the United States are "exceedingly concerned." She asked for the crowd's prayers for Puerto Rico but also the other islands, Texas and Florida that have been recently impacted by hurricanes. The National Hurricane Center (NHC) released its latest advisory tonight to say that Hurricane Maria is gradually nearing the Turks and Caicos Islands with sustained winds of 125 mph -- a slight uptick from the 120 mph winds earlier in the night. Maria remains a Category 3 hurricane. Maria is moving toward the northwest near 9 mph, NHC says, and the eye will continue to pass offshore of the northern coast of the Dominican Republic this evening, and then move near or just east of the Turks and Caicos Islands and southeastern Bahamas later tonight and on Friday. NHC says an additional 4 to 8 inches of rain is expected in Puerto Rico and an isolated maximum storm total totaling 40 inches. Tropical storm conditions are possible in the central Bahamas beginning late Friday. A day after Hurricane Maria ravaged Puerto Rico, flooding towns, crushing homes and killing at least two people, millions of people on the island faced the dispiriting prospect of weeks and perhaps months without electricity. The storm knocked out the entire grid across the U.S. territory of 3.4 million, leaving many without power to light their homes, cook, pump water or run fans, air conditioners or refrigerators. Now many are hunting for gas canisters for cooking, collecting rainwater or steeling themselves mentally for the hardships to come in the tropical heat. Some are even contemplating leaving the island. "You cannot live here without power," said Hector Llanos, a 78-year-old retired New York police officer who planned to go back to the U.S. mainland on Saturday to live there temporarily. Like many Puerto Ricans, Llanos does not have a generator or gas stove. "The only thing I have is a flashlight," he said, shaking his head. Puerto Rico's government hired 56 small contractors to clear trees and put up new power lines and poles and will be sending tanker trucks to supply neighborhoods as they run out of water. The entire island was declared federal disaster zones. Mike Hyland, senior vice president of engineering services for the American Public Power Association, a utility industry group that is sending repair crews into the Caribbean, refused to speculate on how long it would take to restore power. The storm knocked out the entire grid across the U.S. territory of 3.4 million, leaving many without power to light their homes, cook, pump water or run fans, air conditioners or refrigerators. The National Hurricane Center (NHC) released its latest advisory to report that catastrophic flooding is occurring in Puerto Rico -- and everyone on the island should continue to follow advice from local officials to avoid life-threatening flooding conditions. Hurricane Maria is moving northwest near 9 mph with maximum sustained winds of 120 mph. NHC says tropical storm conditions begin to spread over the Turks and Caicos Islands. Maria's eye will continue to pass offshore of the northern coast of the Dominican Republic this evening and then move near or just east of the Turks and Caicos Islands and southeastern Bahamas tonight and Friday. Swells from Hurricane Maria are expected to begin reaching the coast of the southeastern United States on Friday which could cause dangerous surf and life-threatening rip currents along the coast for several days even though Maria is forecast to stay well offshore in the western Atlantic Ocean, NHC says. Uprooted trees and widespread flooding blocked many highways and streets across the island of 3.4 million residents, creating a maze that forced drivers to go against traffic and past police cars that used loudspeakers to warn people they must respect a 6 p.m. to 6 a.m. curfew imposed by the governor to ensure everyone's safety. People resorted to rafts and kayaks to get around because flooding made many roads remained impassable. "This is going to be a historic event for Puerto Rico," said Abner Gomez, the island's emergency management director. The U.S. Coast Guard says a woman and two children were rescued from a boat that went missing off Puerto Rico during Hurricane Maria, but a man died aboard the vessel. The Coast Guard in Miami said in a statement that a British Royal Navy helicopter hoisted three people Thursday from the capsized vessel. It had sent a distress call Wednesday saying it was disabled and adrift in seas with 20-foot waves and 100 mph winds near Vieques, Puerto Rico. The Coast Guard says the dead man's body was not retrieved and that the boat had capsized. The search included an HC-130 search plane, a fast response cutter, the USS Kearsarge amphibious assault ship and Navy helicopters. The names of those on the vessel were not released. Hurricane Maria has strengthened slightly as it nears the Turks and Caicos Islands and the southeastern Bahamas. The National Hurricane Center in Miami says data from reconnaissance aircraft showed maximum sustained wind speed increasing Thursday to 120 mph, up slightly from 115 mph. It remains a Category 3 hurricane. Hurricane conditions are expected to begin in the Turks and Caicos Islands and the southeastern Bahamas late Thursday or early Friday. Dominica Tourism Minister Robert Tonge said his badly damaged country's capital of Roseau still has severe flooding three days after Hurricane Maria made landfall in the eastern Caribbean island and there's heavy damage throughout the city. The hospital and a community center both lost roofs. One of two airports serving the country is inoperable while the other is expected to be operational in the coming days. An estimated 95 percent of the roofs were blown off in some towns, including Mahaut and Portsmouth. There are at least nine communities that no one has any information about because they're cut off and most communications are down in the country. Prime Minister Roosevelt Skerrit said more than 15 people are dead and 20 remain missing after Maria's direct hit. Skerrit cried as he spoke to a reporter on the nearby island of Antigua. He said it was a miracle that the death toll was not in the hundreds. The center of the Category 5 storm hit Dominica with massive force late Monday night and early Tuesday, destroying hundreds of homes and cutting off the mountainous island's communication systems and shutting its airport. Skerrit says Dominica "is going to need all the help the world has to offer." Dominica Prime Minister Roosevelt Skerrit says at least 15 people are dead and 20 missing on the Caribbean island after Hurricane Maria. The death toll on the hard-hit island was seven before Skerrit's announcement Thursday. Hurricane Maria was heading toward the Turks and Caicos Islands Thursday morning, the National Hurricane Center said. Forecasters expected tropical storm conditions to begin on the islands and in the southeastern Bahamas later Thursday. Hurricane conditions were expected there Thursday night or early Friday. At 11 a.m., Maria remained a Category 3 hurricane with maximum sustained winds of 115 mph. Its eye was located about 105 miles east-northeast of Puerto Plata, Dominican Republic, and about 155 miles southeast of Grand Turk Island in the Turks and Caicos. The major hurricane was moving northwest at 9 mph. Forecasters say a severe flood threat is continuing across Puerto Rico as Hurricane Maria's outer rain bands pelt the island. Senior Hurricane Specialist Mike Brennan at the National Hurricane Center says rains are expected to dump at least 4-8 inches of additional rain and up to 35 inches in isolated spots on the island. "We're still seeing heavy rainfall occurring over Puerto Rico," Brennan said Thursday via social media from the Miami-based center. "We could see 4-8 inches of additional rainfall through Saturday that will exacerbate the ongoing flash-flooding situation that's occurring over that entire island." He warned Puerto Rico residents who are venturing out after the storm to avoid areas near already flood-swollen rivers and not to attempt to cross flooded highways and roads on foot or in vehicles because of the threat to personal safety. Forecasters say the ongoing rains also raise the risk of life-threatening mudslides. President Trump has pledged to visit Puerto Rico, which he said was "absolutely obliterated" by Hurricane Maria. While the president was meeting with Ukrainian President Petro Poroshenko in New York, a reporter asked if he would visit the U.S. territory. "Yes, I will," Mr. Trump said. Mr. Trump provided no immediate details about when he would visit the island. The president went to Texas and Louisiana after they were hit by Hurricane Harvey, and he visited Florida after Hurricane Irma struck the state. Mr. Trump and Poroshenko are in New York for the annual U.N. General Assembly. President Trump has approved a federal disaster declaration for Puerto Rico. The White House announced Thursday morning that Mr. Trump approved the declaration on Wednesday, the same day Hurricane Maria made landfall on the U.S. territory. The declaration makes federal funding available to Puerto Ricans affected by the storm, which has knocked out power across the entire island and caused flooding and landslides. Hurricane Maria remained a major storm as its eye was passing offshore of the northeastern coast of the Dominican Republic, the National Hurricane Center said. At 8 a.m., Maria was still a Category 3 hurricane with maximum sustained winds near 115 mph. Its eye was located about 95 miles north-northwest of the resort city of Punta Cana, Dominican Republic, and about 190 miles southeast of Grand Turk Island in the Turks and Caicos. It was moving northwest at about 9 mph. Forecasters said it was possible for Maria to gain more strength over the next day or so. In its 5 a.m. advisory, the National Hurricane Center said Hurricane Maria was centered about 70 miles north of Punta Cana, Dominican Republic, and heading northwest at 9 mph. The Center said the storm's eye would continue to pass offshore of the northeastern coast of the Dominican Republic over the course of Thursday before moving toward the Turks and Caicos Islands and the southeastern Bahamas by Friday evening. "Some strengthening is possible during the next day or so," warned the advisory. An update from the Miami-based center says maximum sustained winds have increased to near 115 mph with higher gusts. Maria's fierce core was centered about 55 miles northeast of Punta Cana, Dominican Republic. It will continue to move away from Puerto Rico during the next several hours, and then pass offshore of the northeast coast of the Dominican Republic early Thursday. Maria should then move near the Turks and Caicos Islands and the southeastern Bahamas tonight and Friday. President Trump has declared a major disaster in the U.S. Virgin Islands after Hurricane Maria hit. Mr. Trump's action early Thursday makes federal funding available to people on the island of St. Croix. President Trump again tweeted about Hurricane Maria, writing "we are with you and the people of Puerto Rico" to Gov. Ricardo Rossello. Earlier Wednesday Rossello asked Mr. Trump to declare the island a disaster zone, a step that would open the way to federal aid. The National Hurricane Center said Maria is moving away Puerto Rico, but the island is still being slammed by torrential rains. Maria is expected to bring 20 to 30 inches of rain through Saturday to Puerto Rico, the National Hurricane Center said. Strong gusty winds are still occurring over portions of Puerto Rico, but should continue to gradually subside. The storm had maximum sustained winds of 110 mph, making it a strong Category 2 storm. The eye of Maria is moving away from Puerto Rico, heading toward the Dominican Republic and then is expected to move toward Turks and Caicos. 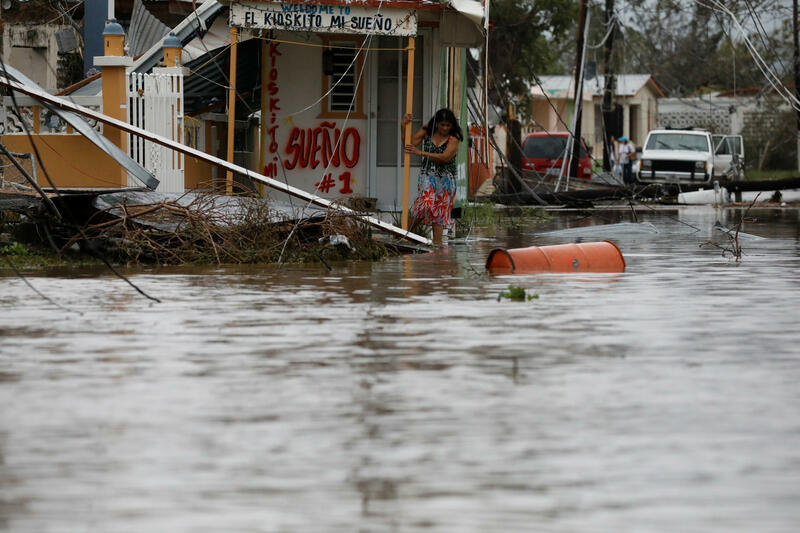 Felix Delgado, mayor of the northern coastal city of Catano, told The Associated Press that 80 percent of the 454 homes in a neighborhood known as Juana Matos were destroyed. The fishing community near San Juan Bay was hit with a storm surge of more than 4 feet, he said. The U.S. Virgin Islands Department of Tourism says people who want to visit the Caribbean territory should postpone their trip while authorities assess the effects of Hurricane Maria on St. Croix and recover from the damage to St. Thomas and St. John from Hurricane Irma. The department says Hurricane Maria brought heavy rainfall and flooding to St. Croix when it passed to the south of the island and communications throughout the islands are limited. There were no immediate reports Wednesday of any casualties from the storm on St. Croix. Click here for Wednesday's updates on the storm.